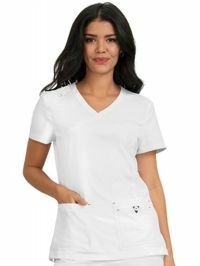 A modern yet affordable scrub top that features a mock-wrap neck, contrast print facing at neck, bungee loop for ID badge, lightweight moisture-wicking fabric, four pockets including hidden cell phone pocket with print lining and a rib-knit trim on sides. 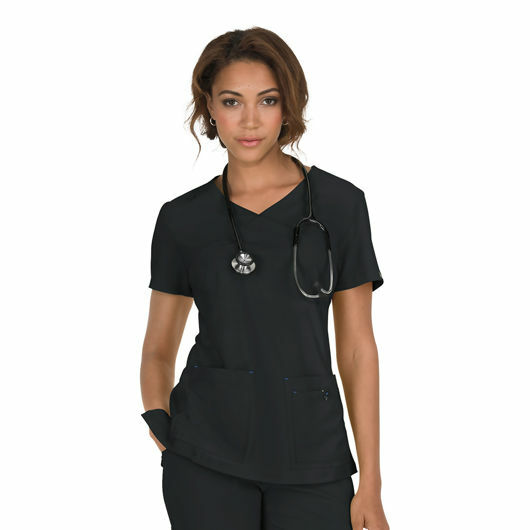 Delivery is FREE for all orders over £75.00 + vat. If your order is below £75.00 + vat then a carriage charge of £4.95 + vat will be added to your order. For orders going to Northern Ireland a charge of £6.95 + vat will be added. For Eire a charge of £12.95 will be added. We hope you are satisfied with all of your purchases, but if you however need to return an item you can do so within 30 days from the date your parcel was received. Please note, if you need to return an item after 30 days we will either deduct a 20% surcharge or reject the return. Please contact our sales team before sending an item back which is over 30 days. You can use our DPD return service at a cost of £6.50 if you prefer. Please click on the link in the returns section on our homepage.